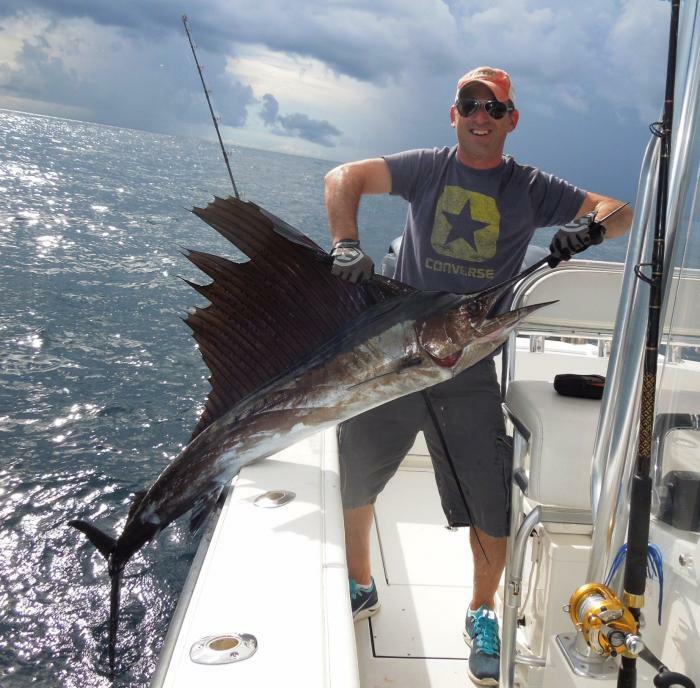 Whether you call it Sailfishing or sailfish fishing, the action off the Miami and Miami Beach coast is red hot in the January through April time frame. That's the time of year when cold fronts pass through our area on a fairly regular basis. This in turn cools down the water temperatures and that drives the sailfish south through our area. When the air temperatures moderate and the water temperature climbs back up, you can expect the Sailfishing to get red hot again as they pass back through the Miami and Miami Beach area. When you charter Knot Nancy for a day of Sailfishing we'll start by loading up the livewell with threadfin herring and/or pilchards. From there it is a short run out to the blue/green edge where we'll deploy kite baits, flatline baits, as well as bait on the downrigger. If the wind is on the light side the day of your charter, we'll still be able to fly the kite baits by attaching a helium balloon to the kite to help it get up in the air. We'll work both sides of the blue/green edge till we find the fish and the action begins. The thrill of watching sailfish stalk baits suspended from the kite will have you holding your breath. Once the sailfish catches the bait, the fun begins. Each fish reacts in a different manner and you have to be quick to adjust your reactions. 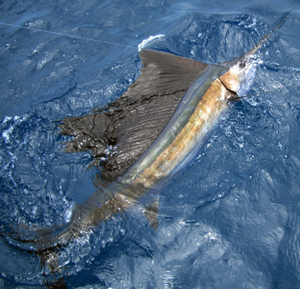 Multiple hook ups of sailfish are quite common and the thrill of having two or more sails jumping and running will keep everyone on board hopping to keep up with the action. Many times while Sailfishing, we also get the opportunity to watch the sailfish chase flatline baits to the surface before they catch them. By now you probably realize that Sailfishing is a very visual type of fishing. This is even more evident when you see one or more sailfish surfing down a wave coming at us at a very fast clip. All sailfish on your charter with Knot Nancy will be released so that someone else in the future will be able to enjoy the same thrills that you experienced. A picture or reproduction mount along with all your visual pictures will last in your memory for a very long time. Speaking of reproduction mounts, it is ABSOLUTELY NOT NECESSARY TO KILL A FISH TO HAVE IT MOUNTED!! Don't let anyone tell you otherwise. All reproduction mounts are exactly that and do not require any fish parts to build. On your charter fishing trip aboard Knot Nancy, you will never get any high pressure sales tactics to have a fish mounted. If you're interested in having a fish mounted, let me know when we set up the charter or before we leave the dock. When we get back to the dock at the end of your charter, I'll give you the information about having your fish mounted and you decide from there. 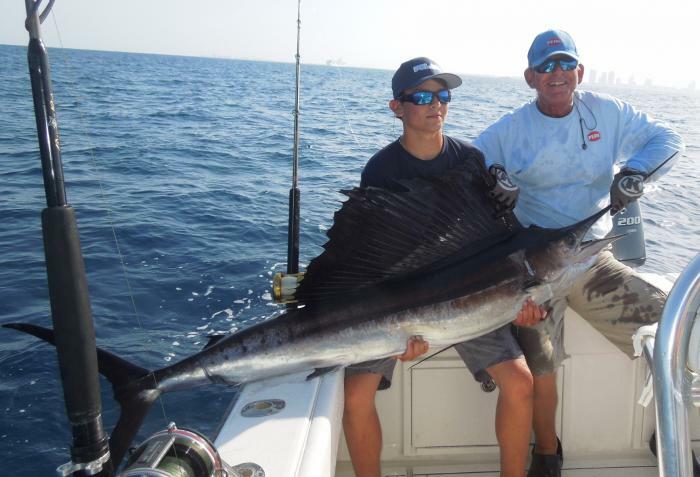 Whether you are local or coming to Miami or Miami Beach on vacation, business, or to see family, make sure to allow a day or two for a charter fishing trip to catch sailfish. And by all means, don't forget to bring a camera or video recorder to capture all the action. To schedule your sailfish fishing trip, give Captain Dave a call at 305 965-9454, email him at nkostyo@bellsouth.net or go to the rates page for more information. It's that easy to schedule your charter.